Hundreds of energized citizens turned out for the Public Hearing of The Committee of Consumer Affairs and Protection in support of The New York State GMO labeling bill A3525-A on Tuesday. Late last week, The New York Times reported what many of us already know, 93% of Americans want food products containing genetically modified foods to be labeled on the package. That overwhelming public support for our right to know permeated the room where The Committee for Consumer Affairs and Protection in NYS, heard arguments from both sides of the GMO labeling issue. Those giving testimony in favor of labeling were far more persuasive than those who argued to keep consumers in the dark about their consumption of GMOs. The most powerful and enlightening testimony came from Dr. Michael Hansen, senior scientist at Consumers Union, the policy and advocacy arm of Consumer Reports. To give you a sense of his talk, here is his testimony on I-522- the Washington State legislative initiative to label GMOs. He blew us away with the depth of his scientific knowledge of GMOs and the regulatory processes that govern them, or lack thereof. To address the issue at hand, Dr. Hansen reasoned that if GMOs go unlabeled, we will be unable to trace health effects back to the GMOs that a person consumed. He gave the example that if a person eats a GMO tomato that is engineered with a gene from a kiwi fruit and that person is allergic to kiwis, it will be very difficult to trace the allergy back to the GMO tomato, if it is not labeled as GMO. He stressed the importance of labeling as a means to trace the epidemiology of disease, especially given the largely untested nature of the GMOs in our food supply. Dr. Hansen also discussed how the FDA doesn’t do any safety testing on GMOs, even though independent research links disease to the consumption of GM food. The FDA simply accepts research submitted by Monsanto’s own executives and scientists to determine the safety of their products. Monsanto has made it illegal for the public to use their patented seeds for research, which is why there have been few independent studies to come out of the USA. Dr. Hansen conveyed with certainty that there has indeed been valid research that shows negative health effects and problems with GMOs. All of his written testimony with corresponding links were submitted to the committee beforehand. The doctor submitted substantial answers to the committee’s 40+ minutes of questioning. It was so empowering to hear such a credible and intelligent doctor build the case for GMO labeling in regard to their impact on our health. While we, at Hudson Valley for No GMOs, are advocates for organic and sustainable farming, we couldn’t help but feel a little bit badly for the GMO farmers who came to speak against labeling. 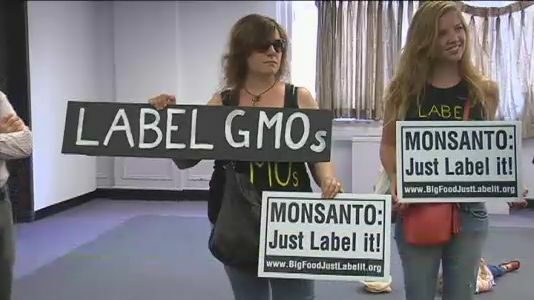 They parroted the sentiments of Monsanto touting the safety and necessity of GM crops. The three farmers knew little about GMOs other than the information that they had been fed by the biotech companies that have the monopoly on soy and corn. One farmer went on the defensive when questioned by the Assembly members provoking laughs and jeers from the crowd who demanded their fundamental right to know how our food is made. Outbursts such as “If you’re proud of it, label it” and “Do your homework“ could be heard when one of the farmers said that GMOs shouldn’t be labeled because they are not a health risk. It became very clear that the farmers no longer have the option to buy non-GMO feed for cattle or non-GMO corn and soy to plant. They spoke about how they could lose entire crops to pests if it weren’t for GMO seed, but were unaware of the super pests that are emerging as a result of immunity to Roundup and to the Bt toxin that is contained in corn. Assembly member Linda B. Rosenthal, educated them about the occurrences of GMO farmers needing to use increasing amounts of Roundup and pesticides to control weeds and insects. She further commented about how the biotech industry is seeking to use 2,4-D, a major component that was used in Agent Orange, a known carcinogen that also creates birth defects. It was great to see many other non-GMO farmers in the crowd and at the press conference beforehand showing their support for the labeling bill. Some of the more objectionable anti-labeling testimony came from the Grocery Manufacturers Association (GMA) and Food Industry Alliance (FIA) of NYS who testified together. They argued that labeling should be done at the federal level. Assembly member Jeffrey Dinowitz pointed out that nothing is getting done at the federal level, which is why we need to consider labeling for NYS. Both organizations work closely with Monsanto and are surely aware that the our federal government is a revolving door for Monsanto executives and that they have enacted laws that protect Monsanto from lawsuits. 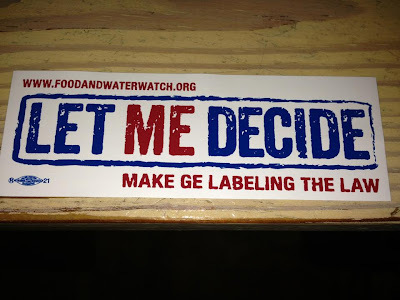 GMA and FIA argued that having to label GMOs for one state would be costly and would cause interstate commerce issues. 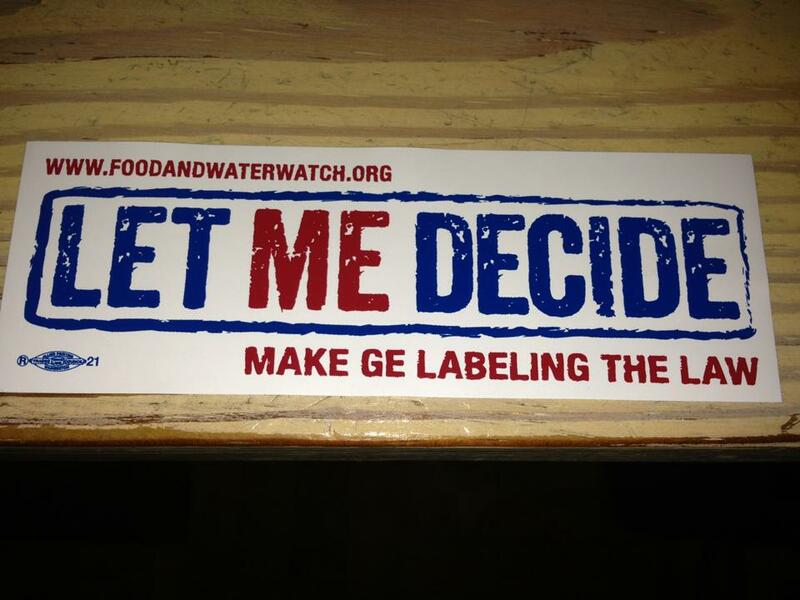 They claim the proposed labeling bill is unfair because restaurants will be exempt from labeling GMO foods. Additionally, they claim that it would be hard for grocers to manage the paperwork involved with collecting sworn declarations for product that don’t contain GMOs and are therefore not labeled as such. We know this is just an excuse because Trader Joes, PCC Natural Markets and Cliff Bar voluntarily use affidavits and/or audits to back their decisions to sell only non-GMO food and ingredients. The GMA and FIA also claim to be concerned that vendors may not get the wording on the label printed correctly or they may not print them in the correct location. These are feeble attempts to make labeling seem like a logistical nightmare that it is not. Assembly member Jeffrey Dinowitz directly asked Louis Dinkel, Executive VP of Government affairs for GMA and Michael Rosen Senior VP of FIA for NYS how much lobbying money they have received from Monsanto and they said they would get back to him with answer. You can bet your sweet organic corn that we’ll be calling to find out the answer to that question and writing to address all of their labeling concerns with the committee. We are also urging everyone to send letters calling for the labeling of GMO foods. We need everyone voice their right to know what we are buying and feeding our families. Assembly Member Linda B. Rosenthal is a no nonsense advocate for our right to know what we are eating. Committee Chair Jeffrey Dinowitz has come out in support of the bill and intends to bring it up again for a committee vote in January! The bill will have to survive multiple committees before going to a floor vote in the Assembly and then heading to the Senate. We may have a tough road ahead of us, but together we can overcome the darkness of deceit and gain our fundamental right to know what we are eating. We are well on our way!